Poor shift Quality and burnt bands are just a few problems caused by accumulator piston ware. Over time the reciprecating motion of the piston causes ware in the piston pin bore. Once the piston pin bore ware gets bad enough it can cause severe fluid pressure loss. Additionaly the Shallow profile of the piston can cause the piston to become cocked and score the piston bore. Sonnax Fixed this with the pinless Accumulator Piston. Its Pinless Design eleminates the possibility of piston pin bore ware. Its additional length adds stability and prevents the piston from becoming cocked and scoring the bore. 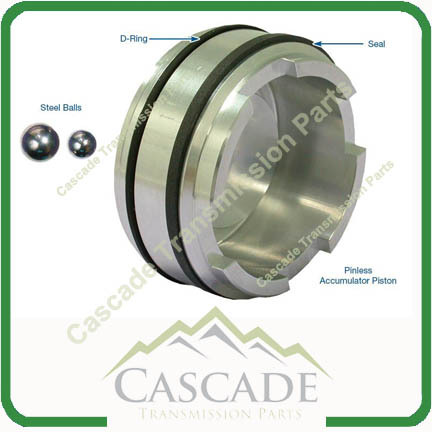 Sonnax also uses dual sealing rings for optimal sealing and shift quality. 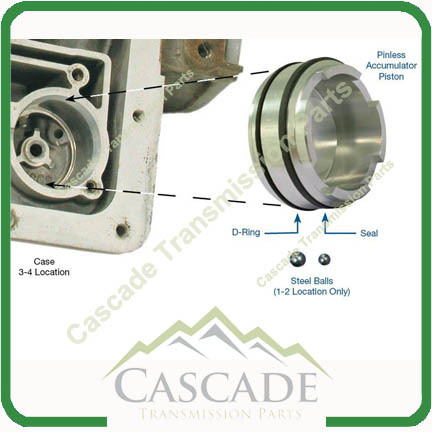 The dual sealing rings greatly improve the longevity of the piston and protects the bore. Note: The Sonnax Pinless Accumulator Piston can be used in the 1-2 and 3-4 Accumulator positions. 1 Steel Ball .312 Dia. 1 Steel Ball .236 Dia.